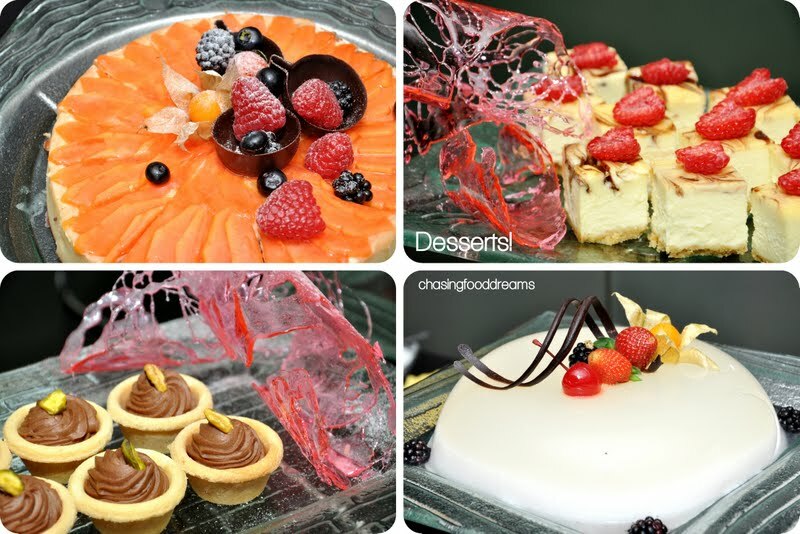 CHASING FOOD DREAMS: Chatz Brasserie, ParkRoyal Kuala Lumpur: ‘REFRESHED’ with New Concepts! 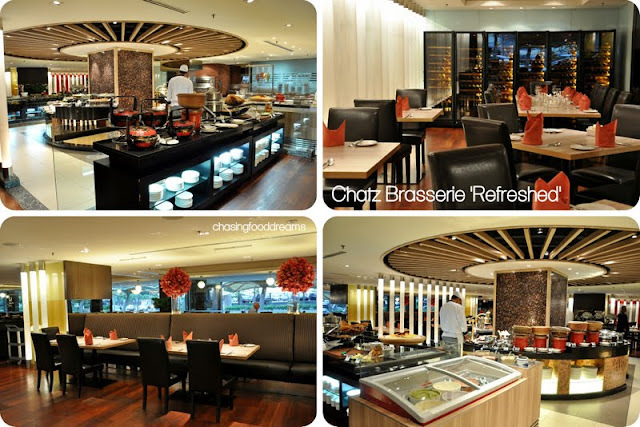 Chatz Brasserie, ParkRoyal Kuala Lumpur: ‘REFRESHED’ with New Concepts! How Does a Kaleidoscope of Seafood, Caviar and Carvery Bar Sound to You? Chartz Brasserie is back after a month’s close for refreshment work! 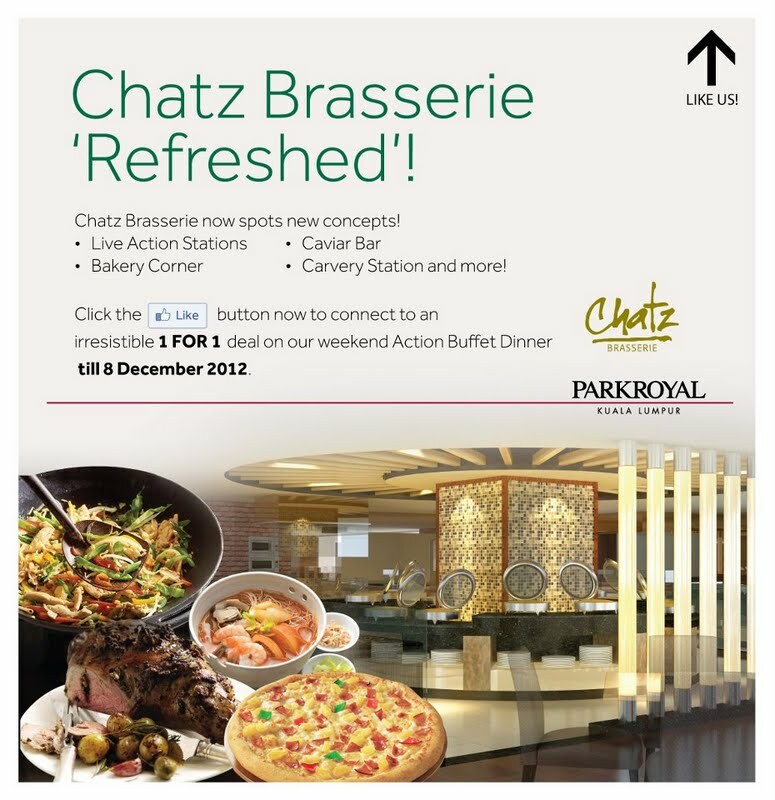 Spotting a ‘REFRESHED’ look, get ready to soaked in a gorgeous new look at Chatz Brasserie Restaurant, PARKROYAL KL and indulge in its new food concepts along its buffet line! The new look is utterly gorgeous with lots of bright pillars of lights glowing beautifully around the buffet bar. Diners will now be able to also enjoy their meal while watching the chefs in action as they whip up dishes fresh upon order. Permanently parked at the buffet line, these action stations are the latest addition to the restaurant. 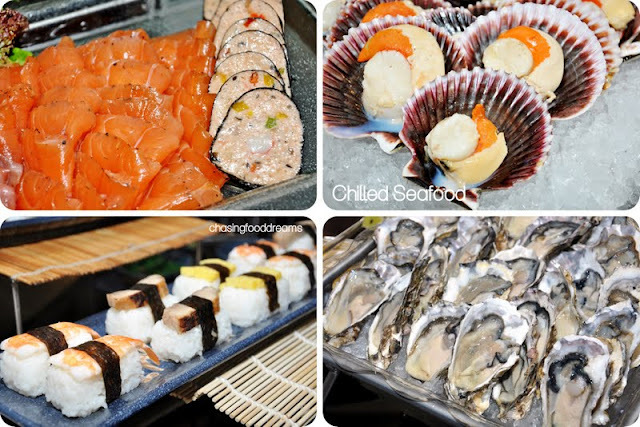 A seafood aficionado like me dived straight for the ocean of Seafood Escapade! A piece de resistance on its own, the chilled bar has Scallops on half shells, Fresh Oysters, Mussels , Prawns, Salmon, Tuna and Butterfish sashimi. Holding fort for flavors are rows of various cocktail sauce, tartar sauce, cranberry sauce, French, and so much more! Don’t hold back, just go for pure indulgence! Oh wait, do save room for their Caviar Bar! There were five kinds of caviars that night which had me making Caviar Blini with the works. 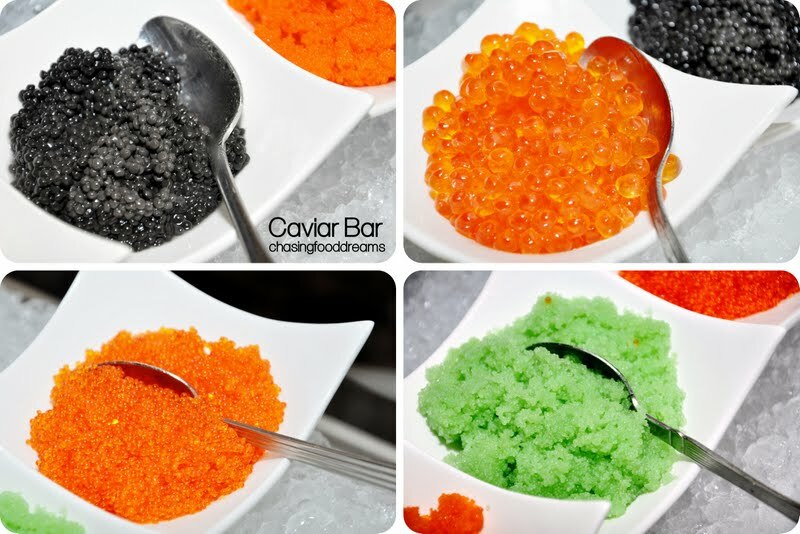 Expect several varieties like Masago Orange, Masago Wasabi Black Lumpfish Caviar, Red Lumpfish Caviar, Capelin Red, Capelin Black, Trout Roe, Salmon Roe, Black Danish and Red Danish. One can also pile on the caviars to the Fresh Oysters like me!! Meat carnivores will be pleased with a Carvery Bar where Roast Rib Eye crowns the station alongside with Roasted Lamb Leg and Chicken Roulade, served with the essentials. Adopting a hawker style concept, there are various live action stations to prepare a-la minute upon order so one gets to customize their choice. Among the available stalls are Chicken Rice, Noodle Bar, Nasi Lemak, Fried Oyster Omelette, Char Kuey Teow, Fried Noodles and more. 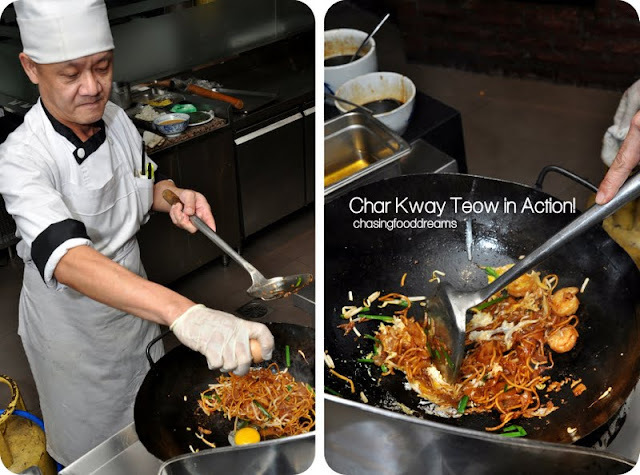 I had a yummy Char Kuey Teow Mee and a Penang style Fried Oyster Omelette. The first had a nice breathe of wok flavors while the latter was a good balance of fried tapioca starch with egg and juicy baby oysters. My noodles had prawns, bean sprouts, chives and egg. I actually wanted cockles but I forgot to ask… do ask if you are a cockle fan! 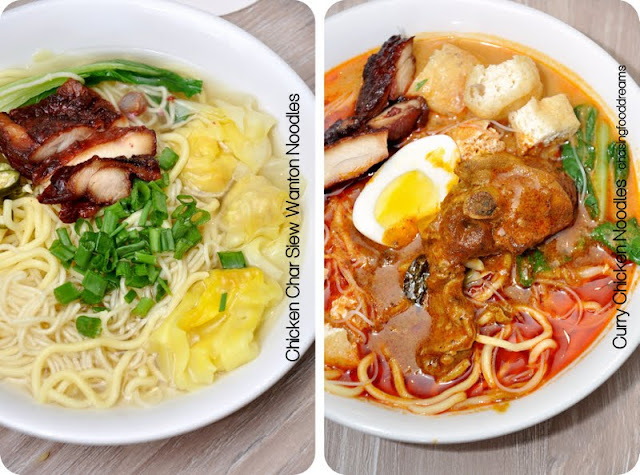 While I dine on my choice, others enjoyed their own custom Chicken Char Siew and Wanton Noodles and Curry Chicken Noodles. I kept hearing raved reviews on the curry noodles that were creamy with good hints of spices and heat. If Chinese roast is not to your liking, how about Seafood on the Grill? Just select your choice and hand them to the chef for some grilling action. A Homemade Pizza Corner is also available where diners get to go wild with their choice of toppings else go for classic ones like Margarita or Hawaiian Pizza to satisfy those hunger pangs. 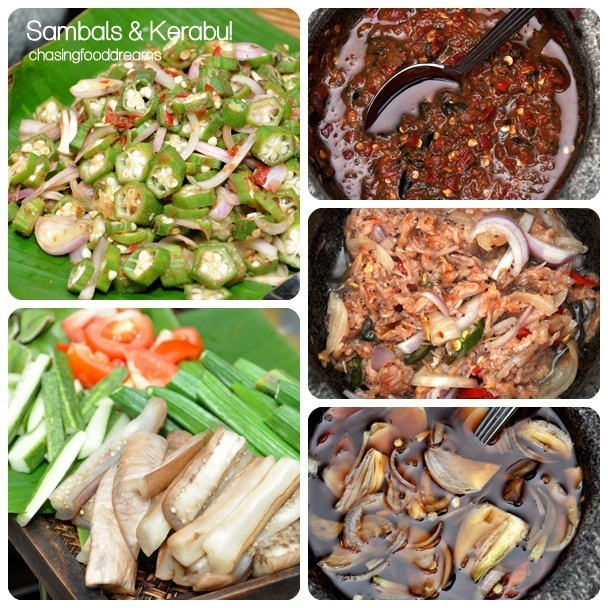 There are also plenty of hot dishes from local to international for savoring. Indian cuisine such as Roti Canai and Capati is freshly made upon order to be savored with luscious dhals and curries. 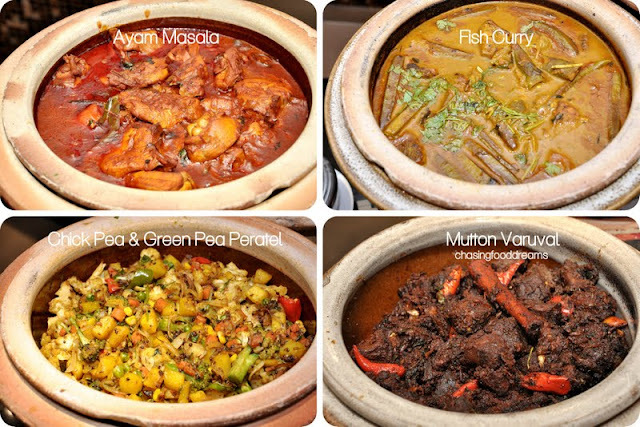 If you must have rice, savor them with Fish Curry, Chicken Masala, Mutton Varuval or Chick Pea and Green Pea Paretal. 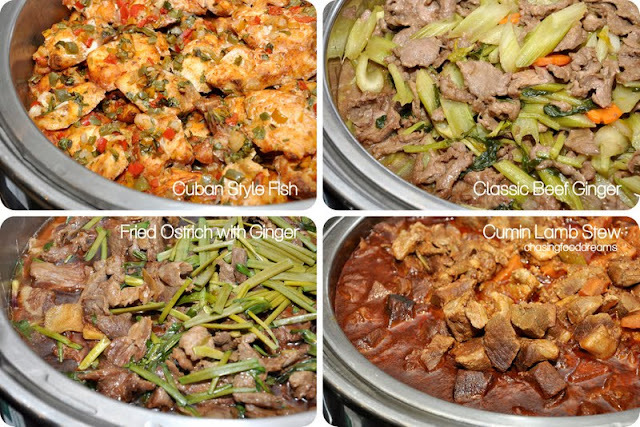 Some international dishes like Cuban Style Fish, Cumin Lamb Stew, Classic Beef Ginger and Fried Ostrich with Ginger and more are also available on rotation. Make sure to save some room for Desserts! The essential Chocolate Fountain was present among other gorgeous desserts. Cheesecakes, Chocolate Tarts, Mini Pavlovas, Fruit Mousse, Puddings and Ice Kacang. Fresh Juices are also available but this is Not included in the buffet. Chatz Brasserie has certainly achieved its ‘Refreshed’ concept. Not only is the place beautiful and comfortable, the food is a lavish spread of seafood and meat with touches of hawker delights. One gets to really enjoy a multitude of local and international flavors at the new Chatz Brasserie in style and comfort. Head over to Chatz Brasserie for some serious pampering with family, friends or business! *Check out Parkroyal Kuala Lumpur Facebook and LIKE them to connect to an irresistible 1 FOR 1 deal on their weekend Action Buffet Dinner from now till 8 December 2012. Chatz Brasserie is open daily from 6.30m till 12 midnight. 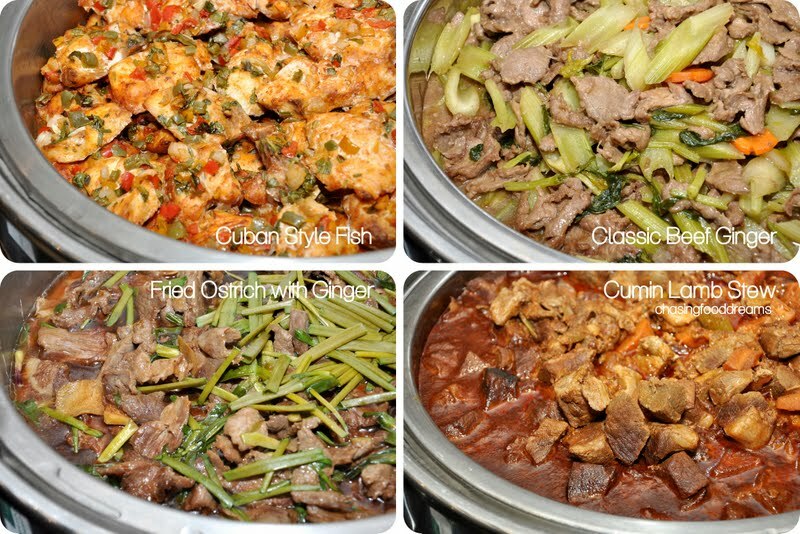 Action Buffet Dinner (Fri & Sat) is from 6.30pm – 10.30pm at RM88++ per person. A la carte menu is also available. Wahhh....bed of fresh seafood! *Drools.. They are quite generous with that caviar bar. Yummmmm!!!! Have always loved the food there - the cakes and pastries are absolutely heavenly. oh yes.. when I saw the Caviar bar.. I was on Cloud 9! Walau weh~~ This is heaven. I love to eat sashimi! then you should enjoy it here, besides sashimi, check that ocean of seafood here... and best of all check out the 1For1 deal!